Baudin is a french flat glass machines processing manufacturer which manufactures belts machines and straight line edging machines from 4 wheels up to 11 wheels. These machines are robust and reliable. 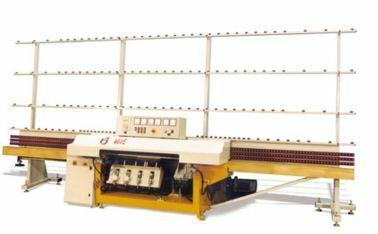 All its straight lineedging machines are mittering machines. These machines are mainly dedicated for small and middle size glaziers. The pressure for polishing wheels is done by springs instead of pneumatic pressure.